The summer season brought a raft of modern art sales to continental Europe and the various salerooms around Germany were no exception. Work by the German Expressionists featured prominently among the best-sellers, with artists such as Max Beckmann, August Macke and Alexej von Jawlensky to the fore. But some other surprises emerged, notably a study of American Indians by a German artist who spent much of his early life in Missouri. In Austria, a record was achieved for a painting by one of Vienna’s famous sons from the Wiener Werkstätte – Kolomon Moser. But sales in the Austrian capital also produced a record for a contemporary work by the Italian artist Emilio Vedova. Max Beckmann (1884-1950) led the field in the Berlin and Munich sales of modern art held in late May and early June. The auctions produced substantial bidding and some remarkable results. The artist’s Tiergarten im Winter (The Tiergarten Park in Winter) was the star of the show on June 1 at Grisebach (30/25/20% buyer’s premium) in Berlin. 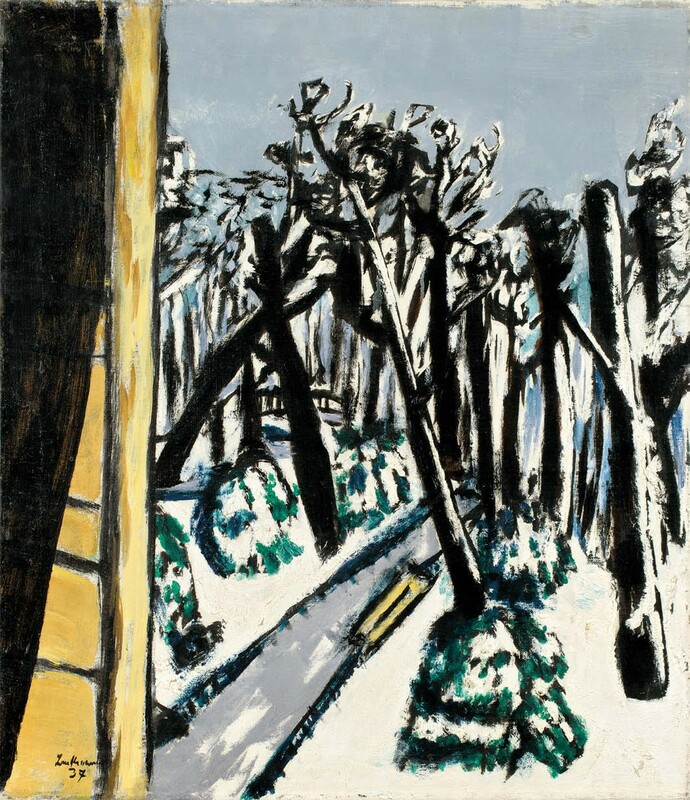 The 2ft 6in x 2ft 2in (76 x 66cm) canvas was painted in 1937 and is one of three related paintings of the view from Beckmann’s apartment across the road from the Tiergarten Park in the heart of Berlin. He had moved from Frankfurt to the capital in 1933, after his dismissal as professor of the school of art there, having been classed as a ‘degenerate artist’ by the Nazis. Later in 1937 he was to flee to Amsterdam and afterwards to New York. The first owner of the winter painting was the New York Buchholz Gallery. Since 1963 it had been in a south German collection. Grisebach had a guide of €700,000-1m but after vigorous exchanges between the room and the phones, a dealer from Düsseldorf secured his prize for €1.5m (£1.3m). 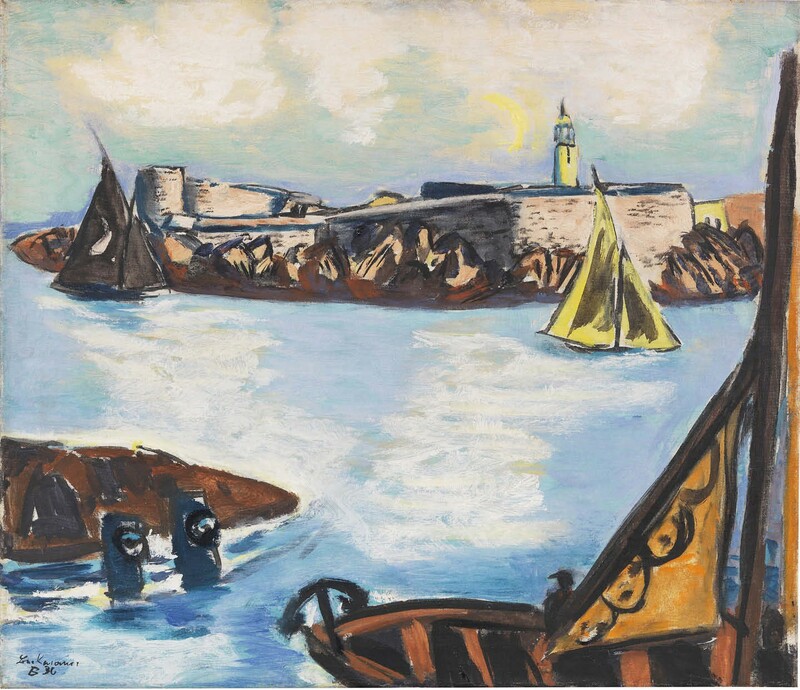 One year before the Tiergarten series, Beckmann had finished his 2ft 2in x 2ft 6in (66 x 76cm) painting Château d’If, which topped the bestseller list at Ketterer (25% buyer’s premium) in Munich on June 10. The fortress and one-time prison situated on the small island just off the coast near Marseille is best known to readers of Alexandre Dumas as central to the plot of The Count of Monte Christo. As with the Grisebach painting, this canvas had passed though the Buchholz Gallery and through the hands of Roman Norbert Ketterer (1911-2002), the legendary art dealer and uncle of the current owner of the firm. Ketterer was expecting €800,000-1.2m but the hammer fell at €1.35m (£1.17m), with a south German collector emerging victorious. 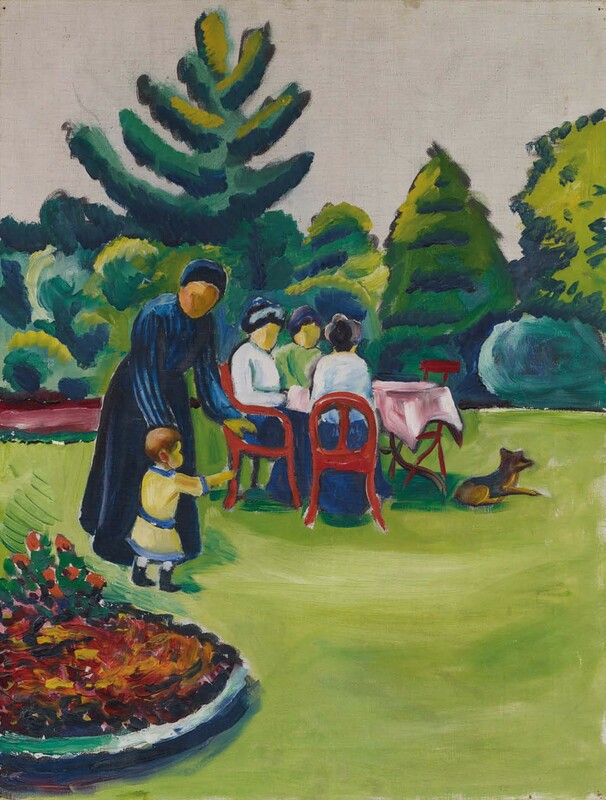 'Coffee in the Garden' by August Macke sold for €480,000 (£417,390) by Lempertz in Cologne. August Macke (1887-1914) was, like his friend Franz Marc, one of numerous German artists who did not survive the horrors of the First World War. Two years before his untimely death in France, he painted his idyllic Kaffeetafel im Garten (Coffee in the Garden), one of several paintings of his family from this period. The scene shows Macke’s son, grandmother, wife, mother-inlaw and the family dog in the garden of their Bonn house. Many similar scenes are documented by photographs that Macke took around this time. It was most probably executed in October 1912 when, incidentally, Franz Marc and his wife were visiting the Mackes in Bonn. On May 31 the garden idyll took top honours at Lempertz (24/20% buyer’s premium) in Cologne, with a hammer price of €480,000 (£417,390), just below the upper estimate. The 2ft 3in x 21in (69 x 53cm) canvas is well documented and had spent the last 48 years in a private collection. It is a perfect illustration of the artist’s ability to capture scenes of everyday life in his own characteristic style. At Karl & Faber (25% buyer’s premium) in Munich, also on May 31, the bidding centred on a one-time close colleague of August Macke. 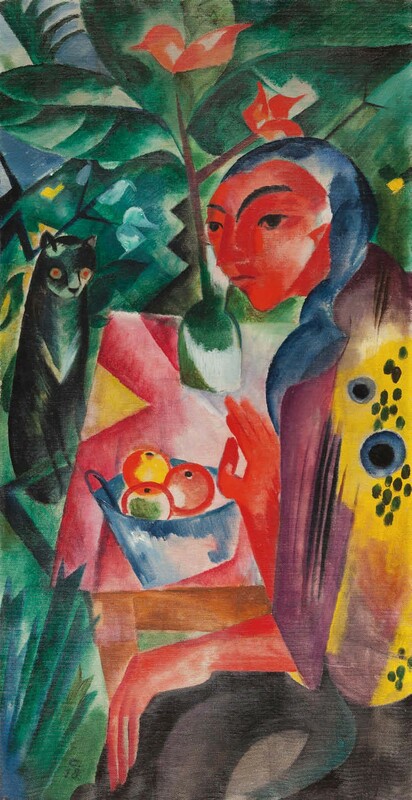 Heinrich Campendonk’s (1889-1957) Mädchen mit Katze (Girl with Cat), a 3ft 1in x 20in (94 x 51cm) canvas, dates from 1918. In 1911 he was the youngest member of the Der Blaue Reiter artists’ group but by 1918 he had distanced himself artistically and developed his own, somewhat mystical style. The provenance of the Munich painting can be traced back to 1919, when it belonged to a museum in Jena. In 1985 it was sold at Christie’s in London to a north German collector, who consigned it for sale. The hammer price of €780,000 (£678,260) was just shy of the upper estimate. As it turns out, the painting does not have far to travel: it was bought by a south German collector. Another artist who, like Campendonk, was closely connected to the Blaue Reiter group of artists and later went his own way was Alexej von Jawlensky (1867-1941). 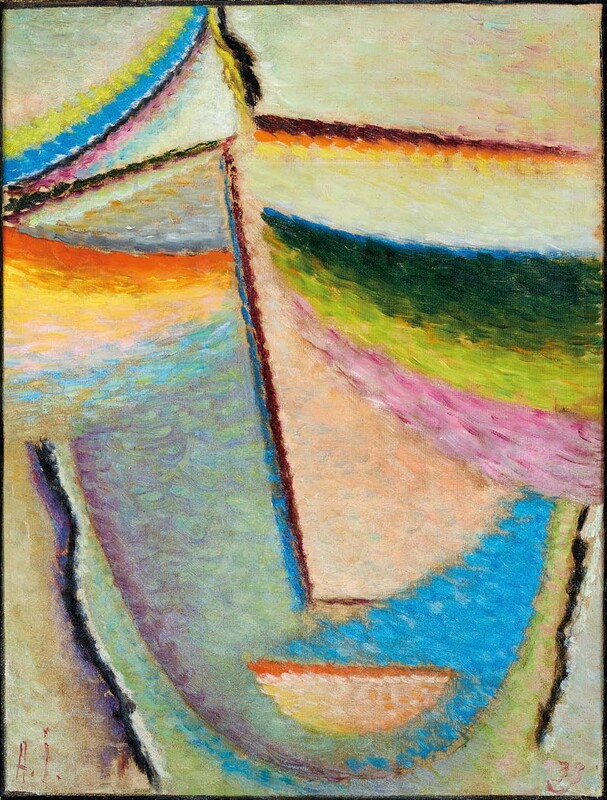 From c.1914 he abandoned all vestiges of realism and began painting his Mystical Heads, stylised abstract compositions in hundreds of variations which were to become central to his oeuvre. Several bidders set their sights on this painting, which was estimated at €50,000-70,000, and drove the price to €185,000 (£160,870), making it the top-seller of the sale.